US Defence Secretary Ash Carter has said the US would not necessarily shoot down a North Korean missile, if it was not threatening. He said the US military would want to gather intelligence from the missile's flight instead of intercepting it. Mr Carter's remarks follow President-elect Donald Trump's Twitter comments on North Korea's nuclear ambitions. Mr Trump had said the North's development of a nuclear missile that could reach the US "won't happen". He did not elaborate how he would stop such plans. North Korean leader Kim Jong-un had claimed in his New Year's Day address that his country had reached the final stages in developing a long-range nuclear missile. What did Trump mean with his North Korea tweet? Mr Carter said on Tuesday in his final press briefing that if a North Korean long-range missile is ever deemed to be threatening, "it will be intercepted". "If it's not threatening, we won't necessarily do so. Because it may be more to our advantage to, first of all, save our interceptor inventory, and, second, to gather intelligence from the flight." 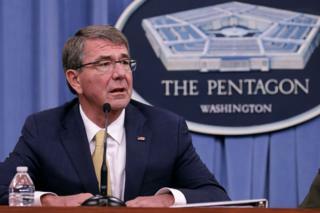 Mr Carter is due to step down as Pentagon chief when President Barack Obama's administration ends on 20 January. But the top US military officer, Marine General Joseph Dunford, who will remain as Mr Trump's top uniformed military advisor and was at the event, agreed with Mr Carter. On Sunday, North Korean state news agency KCNA quoted a foreign ministry spokesman as saying that a missile "will be launched anytime and anywhere" as determined by Pyongyang, despite efforts by the US to contain them. North Korea has conducted two nuclear tests over the last year - five in total - raising fears that it has made significant nuclear advances. It has never successfully test-fired long-range missiles capable of carrying nuclear warheads, but experts estimate it may be able to do so within five years. UN resolutions have repeatedly called for an end to the country's nuclear and missile tests.